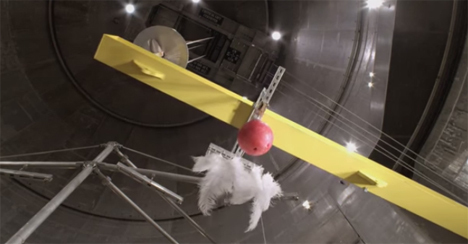 Any science class in the industrialized world will, at some point, mention the experiment in which a bowling ball and a feather are dropped from the same height simultaneously. Due to air resistance, the feather falls far slower than the ball. But when the experiment is repeated in a vacuum – where the factor of air resistance is removed – the outcome is entirely different. Although most of us are aware of the feather/ball experiment and its outcome, actually performing the vacuum part of the exercise is difficult to achieve so remains an abstract concept to non-scientists. Physicist Brian Cox visited NASA’s Space Power FacilityCh in Ohio to make the concept more concrete and understandable. The facility houses NASA’s Space Simulation Chamber, the biggest vacuum chamber in the world. With a volume of around 800,000 cubic feet, the enormous aluminum and concrete chamber contains 30 tons of air when not in use. It takes three hours to pump all but two grams of air out to use the chamber for a vacuum experiment. All of that preparation is completely worth it when you see the feather-and-ball experiment happening in real life. 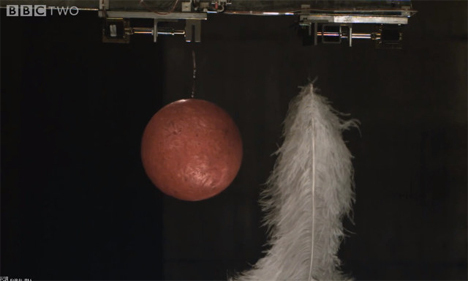 The feathers and bowling ball fall at exactly the same speed and hit the bottom at precisely the same time, an effect that was perfectly predictable for the scientists in the video but still seemed to amaze them. Their glee at seeing the experiment happen right in front of them is precisely why science is so awesome. See more in Earth & Nature or under Science. November, 2014.